What if you made your way home from work one day, or from shopping in your local supermarket or, like 11-year-old Merima, coming home from school? And, just as you do every day, you turn the corner to enter your street… But…what if…where your street used to be there is a huge, gaping crater…and, further up the road, past the scarred buildings, the rubble and the debris….is the crumbling, smouldering shell of your home? Everything you once owned is gone….and worse….everyone you once shared your house with has vanished.. perhaps missing, perhaps injured, perhaps even dead…..What if this happened to you….? This is not a photo of Merima. But this girl looks very similar. This is exactly what did happen to Merima, one of many refugees I worked with during the war in Jugoslavia. And her crime? Simply being an ethnic Muslim…I found her, alone, frightened and withdrawn in an unauthorized refugee camp at Culineca on the outskirts of Zagreb , the capital of Croatia. The conditions there were among the worst I had seen in any camp, over 6500 people living with no clean water, no electricity, no cooking facilities, no sanitation and no medical support. Typhoid, hepatitis, head lice, scurvy, respiratory and intestinal ailments were rampant, not to mention untreated cancers, kidney diseases, heart diseases and diabetes. A couple of months prior to this her two older brothers and her father had been rounded up and taken to Tronopolje, one of the worst of the Serb concentration camps where they had been subjected to the most brutal torture. To this day, nothing more has been heard from her brothers. But her father, suffering ill-health on top of his torture, was likely to die in camp and so, in a rare display of compassion aimed at the world’s television cameras, his Serb captors had released him. Naturally Merima, her mother and sister were overjoyed to see him alive. Their elation, however, was to be short-lived. A week later the bombs dropped on their village. That had been 18 months ago. Since then Merima had been transferred to several refugee camps, finally ending up at Culineca. But, despite her desperate enquiries as to the whereabouts of her family, Merima had heard nothing. 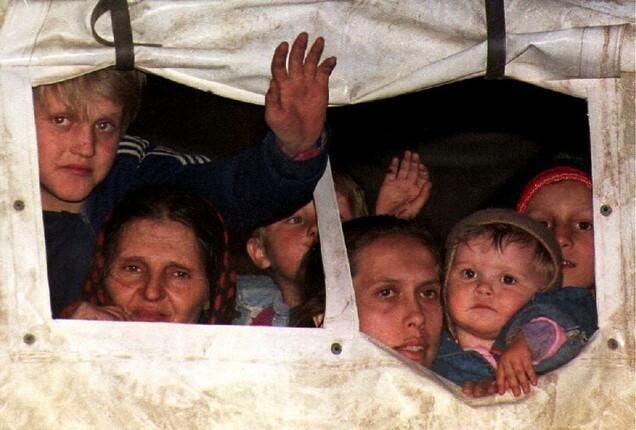 She had no idea whether they had survived, whether they were in another camp somewhere or whether they had managed to flee across the border into Slovenia. I was determined to find out. Merima lent me the only mementoes of her family she possessed – some small faded photographs she kept in her purse. It was not much to go on. I contacted all the main aid agencies in Croatia. I showed them Merima’s photographs and, one by one, they all shook their heads. On my return to England some weeks later I looked up an international Muslim aid group in Birmingham who I knew had been organizing mercy flights for severely injured Bosnian Muslims to receive medical treatment in the U.K. It was a long shot, I know. But God or Allah must have been on my side that day. Someone there recognized the family name. They were fairly convinced that Merima’s father had been flown on a Medivac flight to the UK for emergency treatment. I couldn’t breathe…I mean, what if he was actually here?….What if he had actually been in England all this time? I waited for what seemed like an eternity as files were scrutinized and names and photographs were cross-referenced. Finally, positive identification was made and I found myself being chauffeured to the General Hospital in High Wycombe, an hour north of London. There I found Merima’s father, still a very sick man, with her mother and younger sister at his bedside. Then came the problem. How was I to break the news to them? In the back of the car on the way to the hospital, I had rehearsed again and again what I planned to say but now, faced with delivering the message about Merima to her family, I was struck dumb. In the end, I couldn’t seem to find the right words so I simply hugged Merima’s mother and pressed photographs I had taken of her lost daughter into her hand. With tears in my eyes, I made a rash promise, a promise I doubted I could fulfill a promise I knew I would instantly regret. I promised her I would return to Culineca camp and bring Merima back to the UK with me. Eight weeks later I arrived at Culineca. I was horrified by what I saw. The place now resembled a bomb site. I was told the camp had been declared a health hazard by the government, and just the day before I arrived had been razed to the ground by bulldozers. The refugees had all been rounded up, loaded onto trucks once again and transported, yet again, to various other camps around Croatia. I panicked…Oh, my god, what if Merima was lost? What if I couldn’t find her…? What would I tell her parents? I couldn’t bear to think about it…Amid the rubble, I sat down and shed tears of utter despair. But, suddenly, as if by some miracle, there she was standing right in front of me, a mere child but one of the handful of refugees who had stubbornly refused to leave. I rushed towards her shouting the good news as though she could understand. She threw her arms around me sobbing. I handed her a letter from her parents and a postcard of a bright red London bus from her sister. Through an interpreter, I explained that, in order to be reunited with them, she would have to travel with me through seven countries and seven borders and I only had her parents’ papers and a letter from the Muslim relief organization to get her through. I told her there could be very serious problems. We could well be turned back at any one of those borders. And, even if we did manage to pass through 6 countries successfully, it would be very likely that, at the final border, she would be refused entry into the UK. Merima had never travelled out of Jugoslavia before in her life. She was very car sick, terribly frightened and eerily silent the whole way. She knew so little about me and I realized it must have crossed her mind more than once that I could be kidnapping her. We had no interpreter on the journey home so all I could do was hug her, squeeze her hand and smile reassuringly despite the dreadful, lingering fear we would not succeed. The British border was the one I feared most and, by the time we reached there, I had decided the only thing to do, if we were to have any chance at all, was to smuggle Merima through. At this final stage, I could not risk her being interrogated by some unfriendly immigration officer and turned away because of her lack of papers. So, as we climbed into our truck after crossing the English Channel, I hid Merima under a pile of sleeping bags in the back. In sign language, I told her to keep completely still, absolutely silent. I then held my breath as we approached immigration. Fortune again was on our side. The officers on duty asked a few simple questions but failed to search the back of the truck and waved us through. Again, I hardly dared breathe. I felt the sweat pouring down the back of my neck. All I could think of was what if we had been caught. Merima would have been returned immediately to Croatia and I probably would have ended up in prison. But we had made it, the final hurdle. A few miles down the road, when I was sure the coast was clear, I called Merima to emerge from her hiding place. “We are going to find your Mummy now,” I said, hugging her as she clambered over the seat to join me in the front. I think she understood me for this was the very first time I had ever seen her smile. Finally, two hours later, on the concrete steps outside number 48 Dersingham Road in High Wycombe Merima and her family had a tearful reunion. Merima’s first words to her mother were: “I’m sorry”. Merima and I had both been extraordinarily lucky. On an illegal operation such as this, any amount of things could have gone disastrously wrong. But it helped that she was a very trusting and very brave little girl. Even so, ever since then, neither of us can stop asking ourselves questions….all of them beginning with what if? I am not religious so do not know whether this is the case or not. But I respect your views (my mother, sister and one of my daughters are all Catholics) and I respect their views as well. All I know is that Merima and I were very fortunate and I am grateful that we succeeded in our mission. Thanks Sabino, but I am afraid I am an atheist so I don’t really believe in any plan. It was serendipitous, certainly. And it was meant to happen, probably. And it was fortuitous, definitely. this is such an incredibly brave adventure – and from what you have described, i can just imagine the pain those families went through, and how Merima’s fate intertwined with yours.I hardly know you, if you can do that for someone, you most probably have a beautiful soul. Thank you, that’s so kind. Oh, how utterly courageous and wonderful! This mad world needs Mavericks like you more and more. One girl. One family. But a powerful symbol that our humanity has not been lost amid the insanity. Thank you! Thank you, Carmen…I didn’t think it very courageous at the time….In fact I thought it extremely foolhardy and very risky…But, looking back, I guess it could be considered as courageous by others!! !